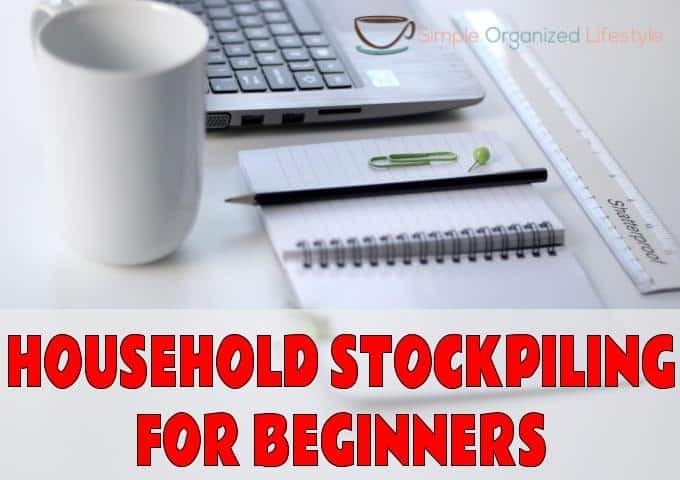 A household stockpiling system requires money and time on the front end but it ends up being a great return on that investment in the long run. So, let’s dive in to what exactly it is, how it can save you money and how to do it! What is a household stockpile? Items that you frequently use (and run out of) bought in bulk to use over an extended time. You find items that are cheaper per unit in bulk than what you normally pay in the store for smaller quantities. It also means less trips to the store to replenish something, which helps you stick to your budget. 1. List your fast moving items. During my college days, I worked part-time as a pharmacy technician. On the end of every aisle were medications called “fast moving.” These were prescribed so frequently that they were always kept in stock. When you think about your home, what kinds of things are “fast moving”? That’s what you would focus on for your first home stockpile. That was our starting place when we created our first home stockpile. I pulled up a spreadsheet on my laptop and listed as many fast moving things in our home that I could think of. Things that are always on our shopping list or stuff that we are always running in a store for because we were out of it. I did not include foods unless it was something I could buy in bulk and know for sure it would be eaten before the expiration. 2. Research the product to determine cost per unit. One item on our stockpile list was trash bags. Definitely an item that is frequently on our list and, wow, they are expensive! Many times we can use the generic of an item, but not trash bags because the problems with ties and tears are not worth saving a few cents. I did a google search from the top 3 places to check prices on trash bags that made sense for where we live. (For us, it was Walmart, Sam’s Club, and Amazon). I researched the unit cost of trash bags and added those to the spreadsheet. We ultimately decided to go with Amazon (Pantry) for every item possible IF it was cheaper per unit than what we normally spend in the store. We’re Amazon Prime members and the difference in our time and gas it would take with a Sam’s Club trip for pennies difference in the cost was worth it. For trash bags, we’re not set on one particular brand so I actually took a gamble on a different kind using product reviews and the price. Since I’ve used trash bags for this example, the “winner” was Member’s Mark Tall Kitchen Simple Fit Drawstring Bags, 13 gallon, 200 Count . Thankfully, they work great because they last for several months! 3. Make your shopping list or complete the online order and keep it on file. Since we ultimately went with Amazon Prime for everything, another bonus is that all of the items are kept in your history and it’s simple to order them again when you need them. If you use another store, keep your list or spreadsheet on file for future reference. I have not tried Amazon’s dash buttons (simply press a button and re-order frequently used items). I’m not that brave with a pre-schooler in the home who loves to push buttons and I like to time our orders when it fits best with our budget. 4. Determine storage ahead of time. We have an unfinished basement so that’s definitely an advantage for storage space. We had a plastic 4 tier shelf we could use in one area and that’s where we store our items. Other ideas might be a garage, closet, or pantry. For anyone that’s stuck with me to this point, the only other information I can provide that might be of interest is a screenshot of what my spreadsheet looked like. A simple Excel spreadsheet with items on the left and columns for the pricing. This entire process took me about two hours one Saturday morning. Also, I quit researching Ingles because it wasn’t a good fit for what we wanted to do. That’s it! This has become a welcome addition to our spending/saving plan. Any other thoughts about a household stockpiling system? I’d love to hear them!